As someone who isn’t overly keen on Autumn and Winter, I do enjoy a little walk when the leaves have turned red, yellow and brown. We’re lucky enough to live right around the corner from a beautiful wood, so it’s always there should we need the fresh air. I’m much more of a non jacket girl, but when I spotted this incredibly puffy and warm jacket in Zara a few weeks back, I knew I had to have it and it has been permanently glued to my back ever since. The gold hardware is just beautiful and I just love the high quality of it – I can see it lasting for a few more Autumn/Winters yet. Myself and two of my best friends are popping up to Edinburgh in a few days and this will, for sure, be my go to jacket as I’m expecting it to be arctic (but beautiful all the same!). 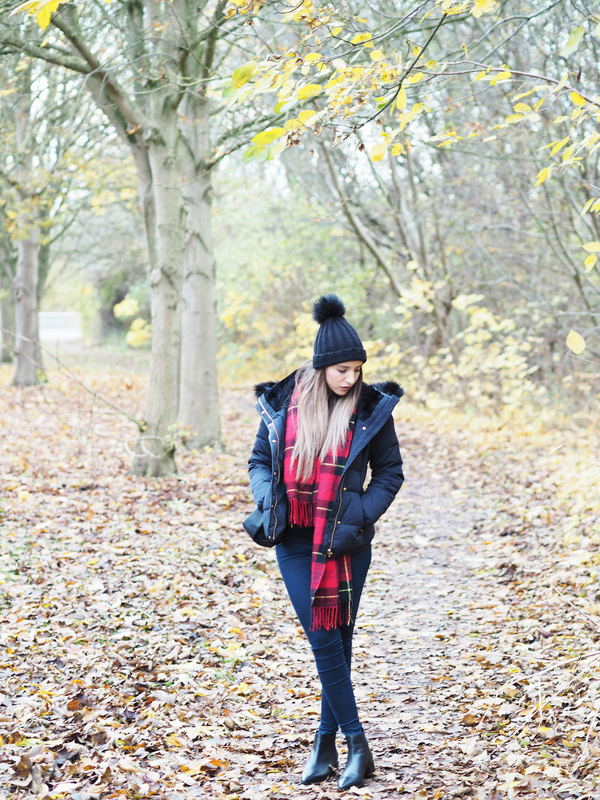 There’s something about a tartan scarf and navy that just hit’s the spot right?